On behalf of the TDSB, we are pleased to release The 2013-2014 Environmental Scan. In supporting our collective efforts to ensure continuous improvement and high levels of success for all students, through evidence-based decision making and accountability, this Environmental Scan provides information about TDSB schools, programs, departments and student achievement. Since the mid-19th century, Toronto school boards have produced portraits of education in Toronto and its place in Ontario. As in the past, this Environmental Scan assists with strategic planning by looking at existing and emerging trends relevant to the TDSB. 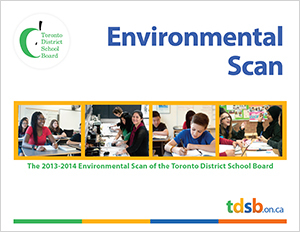 This Environmental Scan is a resource for TDSB schools, students, and staff. It includes a wide range of demographic, social, economic, cultural and data with implications for the TDSB, its schools' mission and work, and for informing curriculum. The Environmental Scan draws from a multitude of information sources including the TDSB's internal and publicly released research reports, the Ministry of Education, Statistics Canada and other research publications and/or reports. We would like to thank everyone who worked hard to create this important system document and all staff who continue to work hard to support every student, every school, every day.